Artist & filmmaker; Lead vocals and rhythm guitar. Composer & musical eccentric; Synth, drums and vocals. Reclusive blues musician; Electric guitar, bass and vocals. Liz and Glenn give birth to Joshua. Glenn’s complex relationship with music (in his earlier years), means Josh initially dedicates his life to the visual arts and film making. While Josh is babysitting him, Mitch (an already highly skilled drummer/pianist and guitarist) encourages them to jam together. Mitch is 14 years Josh’s junior, but becomes his musical guide and teacher. Josh and Mitch continue to hang out and make music together; writing songs, and performing gigs. One weekend Mitch, Josh and Glenn jam for a bit of fun. Through laughter and stupidity, the trio is formed. 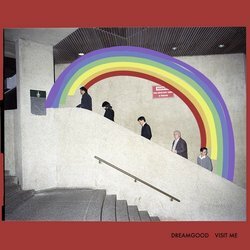 In 2018 DreamGood begin writing, performing and recording together. In 2018 DreamGood record their debut album in Mitch’s home studio. David Akerman records the vocals at Lost Sound. Chris Townend mixes and masters DreamGood, using analog processes to give space to the ethereal DreamGood vibes. 'Visit Me' is dedicated to friend, Mr David Geoffrey Day 11/12/1980-13/07/2016. Paying homage to David’s life, the song examines the haunting nature of dreams, the finality of physical death and the possibility of a spiritual afterlife. The song documents a re-occurring dream I had of David after his passing.